The great debate about whether technology has simplified our life goes on but in terms of decorating, whether we like it or not, we now need to consider a dedicated area in our homes to handle all of our media. Hence many kitchens, studies or living areas are being designed to include media nooks. This is a convenient place where the family can charge their mobile devices and work on a laptop without being away in a different part of the home. Most families will have 3-4 mobile phones, Ipads and other technology devices that may need to share power cords and a pile of these on the kitchen bench top can be pretty annoying. A laptop too, even though it is portable, really needs a dedicated space. Let me share with you therefore some of the favourite media nooks that I have seen to inspire you and I am sure you will agree they are a great addition to an interior scheme. I think this is a brilliant idea as a family control centre. 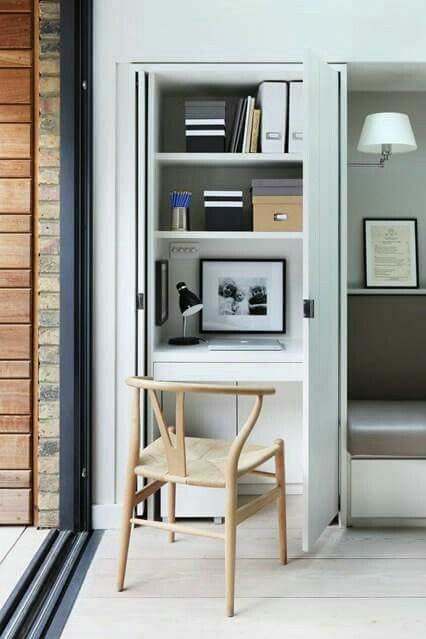 This is the perfect media nook to plan and organise your family’s activities. 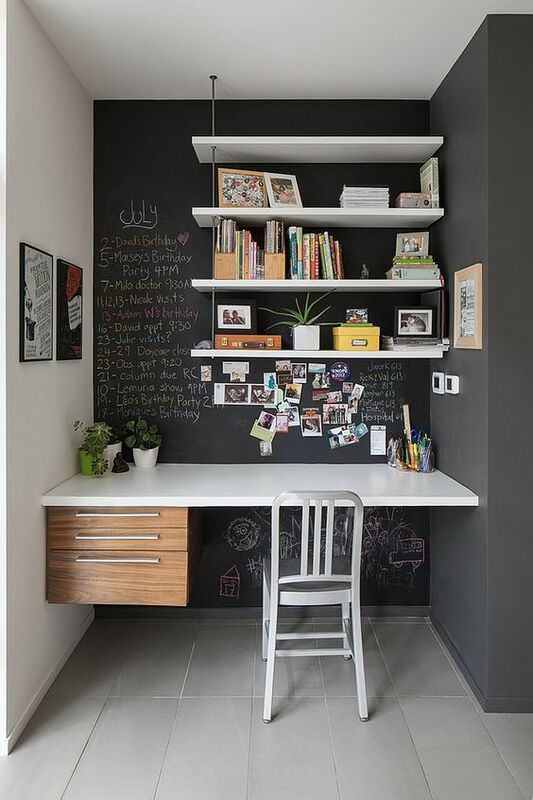 Using chalk paint for the back wall is inspired so that little ones can play at your feet while you manage paperwork or use your laptop. A list of things to do for each month is also a great idea – I really love this one! You can of course make your technology hub a little more refined and build it into living room or kitchen joinery. Having a comfy place to sit here is a bonus. This technology corner really makes good use of a small space. There is enough room for a laptop, room to plug in other devices and shelving for books and folders. 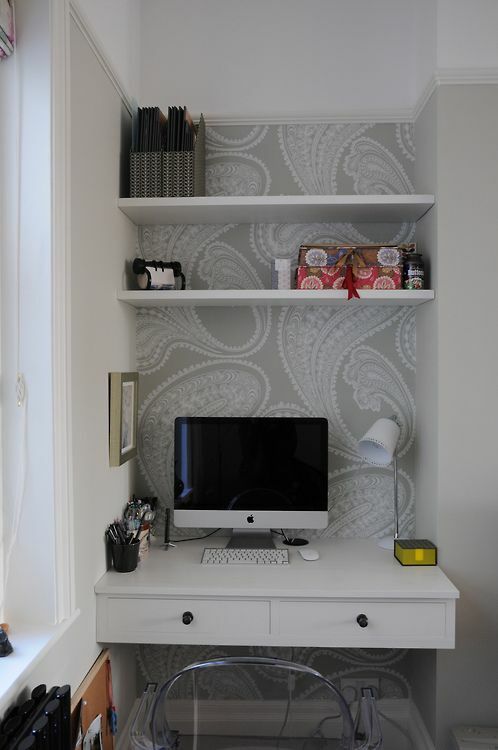 A great example of how to use a small nook to great effect and the wallpaper just completes the look nicely. I absolutely love this one. 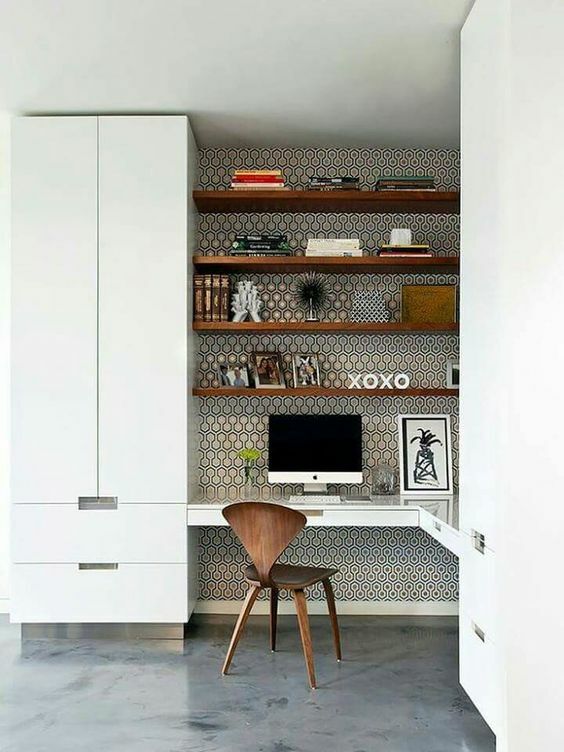 The gorgeous wallpaper here works really well due to the strong lines of the floating shelves. This could be a corner of a living or kitchen area or just a corner of an open plan contemporary home set aside for the home office. 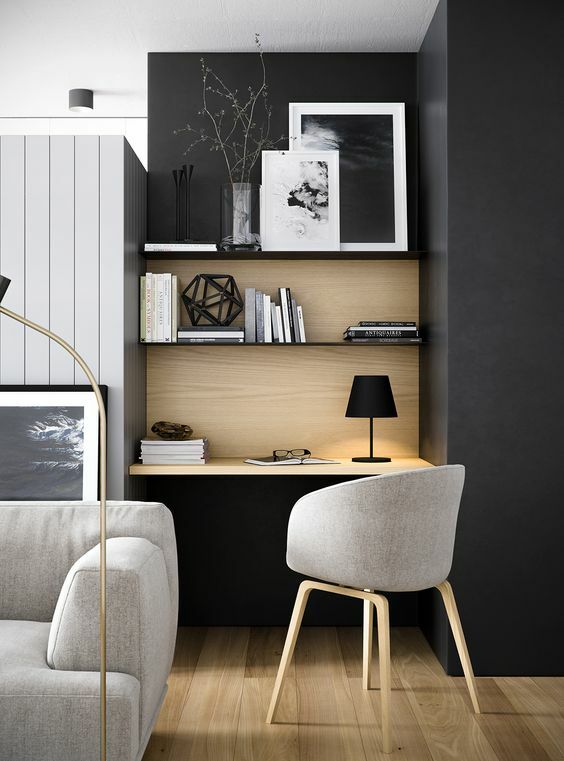 Either way, it is stylish and fun and with a corner nook so beautiful you would have to keep it tidy! A great incentive to be organised. 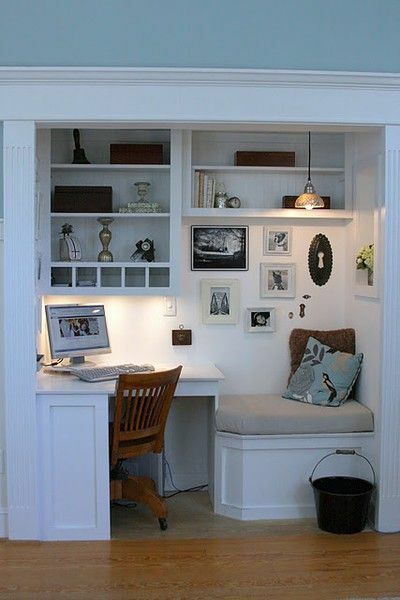 If you don’t think you can control all the papers and general stuff that accumulates in a small home office nook then your best bet is to hide it away! This solution with doors that slide back into the cabinetry is perfect and a small media nook next to a breakfast or dining area is a great solution. Can’t bear to be parted from your mobile devices? Then a media nook in your bedroom joinery is the answer. 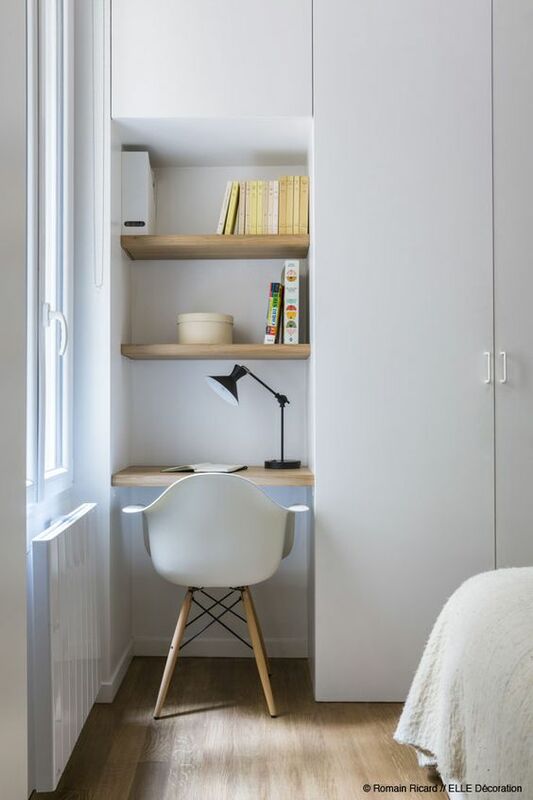 This small nook built in as part of the wardrobe design is a perfect use for a corner space. Add some power points here and your laptop, Ipad and smartphone can all happily charge away but be close at hand. A much better solution than a pile of devices on your bedside table! I love the clever use of colour and tone in this media nook. The dark black walls zone the area while the beautiful pale timber joinery links the flooring. Very sophisticated yet simple design for a great living room media nook. Is your style more classical? If so you may prefer just a small corner like this one. In between the kitchen and the living room and using a stool to match those of the island bench, this is a great use of a small area to create a simple yet effective media nook. Kitchen desk design is now commonplace when designing a new kitchen. Families find this area is integral to the smooth running of family life. A place to use a laptop, re-charge media devices and generally plan the week ahead. This one sits seamlessly next to the refrigerator – how times are changing! 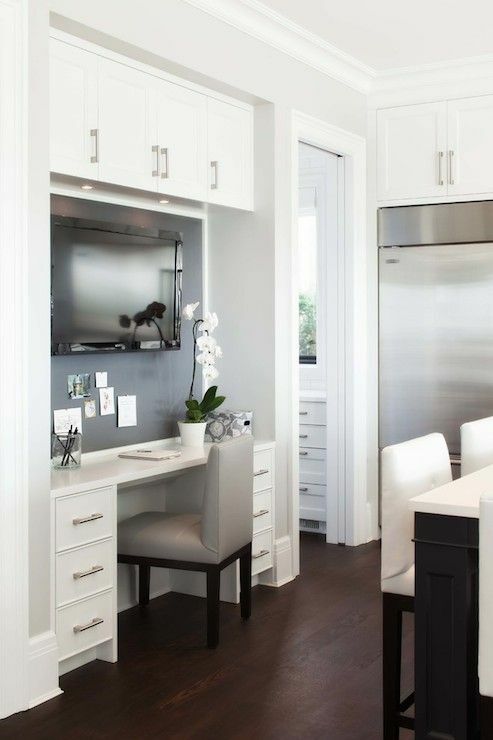 For those of you who love to have a TV in the kitchen, this space offers you everything. 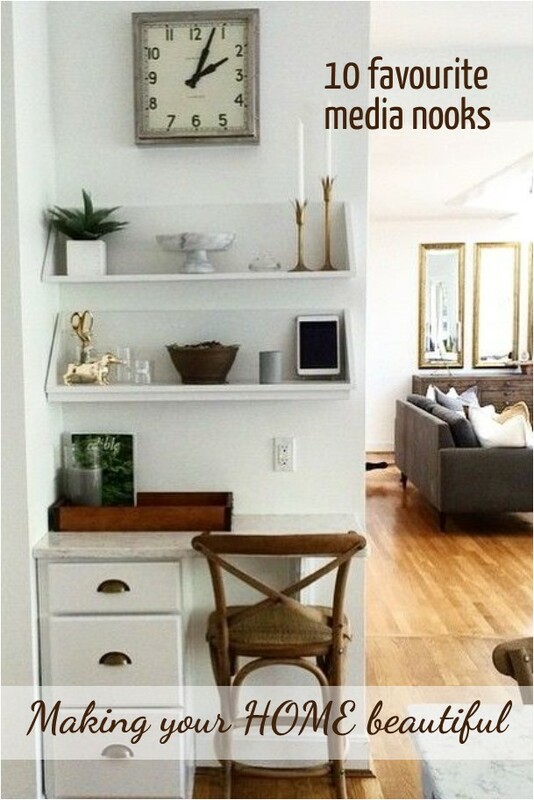 A wall mounted TV and small technology nook in one space is perfect for the modern day family. You can watch MasterChef while you cook dinner! I would love to hear your ideas about how to get organised and whether you like the idea of a media nook or not. Do you like them on show or behind closed doors? As part of the kitchen, the hub of the home, or in a different area? Leave a comment for me below!